Inami and Aoi to Join Popura as Nendoroid!? For some reason, this news slipped past us although we have already known about the magazine scan displaying Max Factory‘s Nendoroid Taneshima Popura. 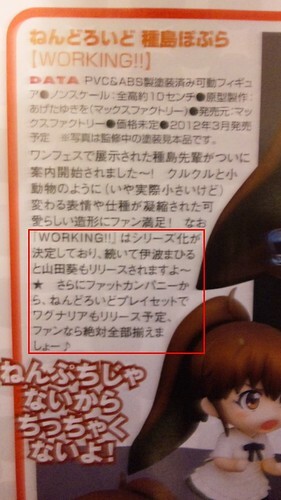 It seems that her fellow co-workers will also join her as Nendoroid waitresses. Yes, Nendoroid Mahiru Inami and Nendoroid Yamada Aoi are reported to be getting an announcement shortly. This entry was posted in News and tagged mahiru inami, nendoroid, working, yamada aoi. won’t buy yamada aoi… I hate her in the series..
but inami is something worth for me! ^^ yay! inami!!! ah, just for an additional information….